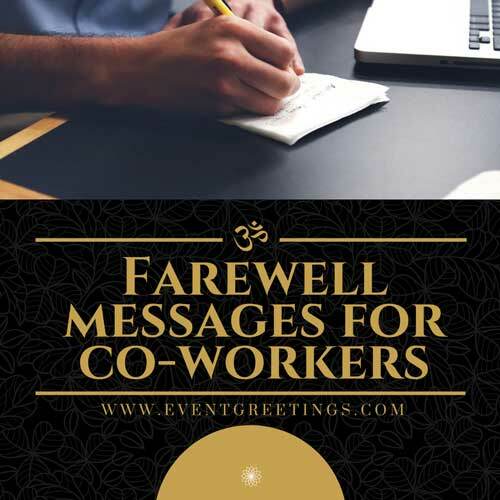 In every step of life, there a time will come when we have to bid our farewell to the friends and colleagues or co-workers. Our colleagues who are more than just colleagues, rather our friends deserve a special farewell. A lovely touching message that could cheer them up. It does not matter if he is retiring or just resigning, we should express his importance to us. We should make him feel that after he is gone, this office and you will miss him deeply. How much fun it was to work with him. Motivational speeches and good farewell quotes are necessary for a person to keep him moving forward. All these awesome farewell messages are given below. This sad feeling of bidding farewell is rare. It means that you have found a true friend, and that is what i am feeling right now. Farewell friend. It is really difficult for me to say you farewell. You are more than just a co-worker, rather you are a true friend and i will always miss you. Good bye, dear. May you find your life successful and full of joy and happiness. Those meeting room that we sit in will now feel more colder because your warmth and help will not be there. I will miss you. Farewell friend. I had never thought that i will have to bid farewell to you someday. You are the reason that i have this job. You have helped me in everything and i was walking on your steps. Those steps are now gone. I will miss you so much. Thanks for everything. Farewell. Have a good life ahead. You are actually my bad habit because you always helped me in my work and now i will miss you very much even if it is a small work. Thank for everything. Farewell. I have many colleagues but none a friend like you. This daily work and monthly targets will come and go, but i will miss those amazing memories i have working with you. Farewell. You are the best. Our team will really be affected after you are gone. With you, we have performed efficiently at every step. Leaving the team’s performance at side, we will all miss you so much. Farewell. May you find success ahead. Having you as my partner was the best professional experience i ever had. Farewell, good friend! This resignation of yours is a reminder that life is cruel and every good thing comes to an end. We may not be co workers any more but we will always be friends. Good Bye. When you leave, this company will rise and we will accomplish something good. Well the truth is, its going to be the opposite. Farewell dear friend. With your resignation, i will have to add another photo on my desk. I am going to miss you. You have been a very good friend to me. Thank you so much. Farewell. May this life take you to the heights of success. We used to be the perfect team, everyone in this office was jealous of our work together. Those were some good days, as you have just resigned. Well, lets see where fate takes us. I bid you a very good farewell. First of all, i will congratulate you on your new job. That is way better than this one. Work hard and achieve excellence. I am going to miss you. We all are! It is sad, when i think about you not having around anymore. Well we certainly can not stick to a single spot in our whole life. Congratulations on your new job. May you find success. Farewell. You farewell has proved to be something good as this party is for you leaving us. Now you are not such a disappointment after all. HAHA kidding bro, you are the best. Farewell. Farewell to my one and only rival in this office. We sure compete a lot. But i have to admit, you were always better than me and i respected that. To compete you i have gained experience and knowledge. You are apparently my reason of success. Thank for everything. May we meet again. Farewell. You are leaving us but your memories will never leave us alone. We will all miss you. Good bye. Farewell to the only person whom i have utmost respect as he is the shinning star of this office. You success has always motivated us and encouraged us to do more and more. You are a good fellow. We are lucky to have you, but good things never last long. So i bid my farewell to you. You are the best thing that happened to this office in years. A colleague like you is really hard to find. You are different from all of us and that is why you are the best. So i say my Good bye. Will meet you in tonight’s party and bid a proper farewell. Farewell to that person whom we trust more than our computers. 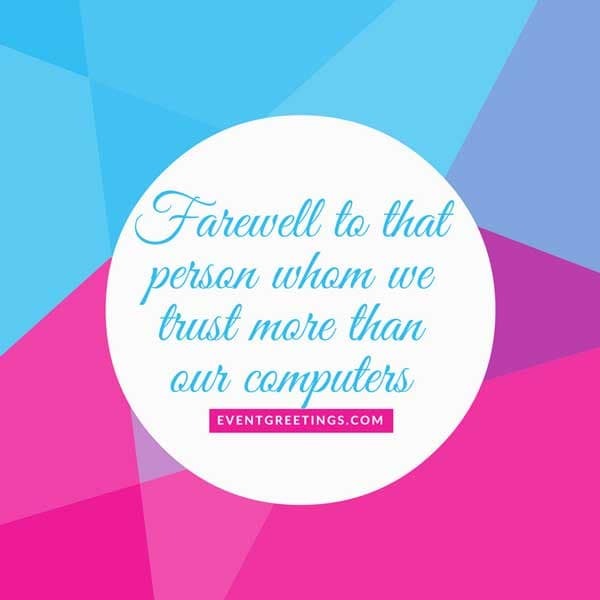 Farewell to that person whom we can trust more than our machines. This company will be at loss for like 4 or 5 months after you leave. You are a valuable asset. We can not deny that fact. Good bye friend. As a favorite employee of the boss, you have always protected us from his rage. Coming to the office and not seeing you around would be difficult for me. This office does not look like office without you. Farewell. You are a very good employee and we all are going to miss you. Sayonara!!! Congratulations on finding this new awesome job. May this will be one of your big step toward success. It is hard to bid you farewell after we have worked all these years together. 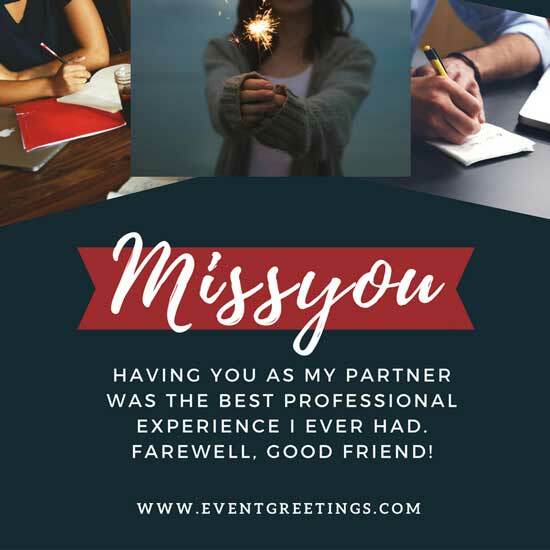 Bidding farewells is the most difficult job for me but i will gladly bid you farewell because you are on your way to success and we will not be a road block for you. Go and fly high. Good bye dear friend. If this resignation is taking you closer to your success than i am more than happy for you. You deserve the best because you are qualified for the best. I always hated farewells but this time i won’t hesitate to bid you a farewell because you are now taking one more step towards your success and i am very happy for you. Farewell my friend, may we meet again. Having you as a colleague is the best experience i had and now i will have to miss you every time i see your desk. It is kinda sad. Farewell friend. In my heart i always knew that someday i am gonna have to say good bye to you because you are very talented fellow and you will achieve something great. These farewells must not stop a person from advancing and gaining success. These farewells are just a stepping stone for a talented person. You should focus on what comes next, rather than what you have left behind but never forget who you are and what you have gone through to get here. You are a really talented person and i know you will achieve something great. I bid you farewell, my dear friend. May you find your success and may you always be happy.